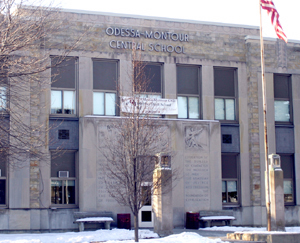 ODESSA—Greg Dale, business administrator, gave an update to the Odessa-Montour School Board on Gov. David Paterson’s proposed cut to schools’ state aid. He said the proposed cut has been recalculated to 5.4 percent, instead of 3.22 percent. Dale explained the amount of BOCES funding in the proposed budget was wrong and when corrected meant a bigger cut to Odessa’s state aid. He added the proposed decrease of $430,415 does not include building aid. Dale said that even if the state legislature gives schools more aid than what the governor proposes, which usually is the case, the district will still be short. He explained that if O-M got the same amount of aid as last year, expenses will go up, and cuts will have to be made. Dale ran down a list of expenditures that are likely to go up and what the increase could be. He said health insurance will definitely go up and that he is expecting unemployment insurance to go up. He said social security would probably go up three to four percent. Superintendent Jim Frame said now is the time to start thinking of ways to make cuts. He said at the next workshop meeting, Thursday, Feb. 25, the board would have more information and start going over the budget. In other business: The board also heard from the school district’s Attorney, Jim Young. He answered questions from the board concerning board operations. New board members Don Roberts Jr. and Matt Walters asked about when e-mailing each other. Walters said he liked hearing back from all board members and not just to Frame, especially when it concerned who would be at an event, etc. Board member Debra Harrington said it comes down to whether the board member wants to “reply all” when corresponding between the board and the superintendent. Roberts asked about having casual conversations with staff, like he has done, if it is all right to express opinions of school maters. Young said it was, though probably not when it is about to come before the board in a meeting. Young added the best way to get information, as in from a teacher, to go through the superintendent. The next regular school board meeting will be Thursday, Feb. 11 at 7 p.m.